You are at:Home»Uncategorized»CSAF: AIRPOWER…GETCHYA SOME! 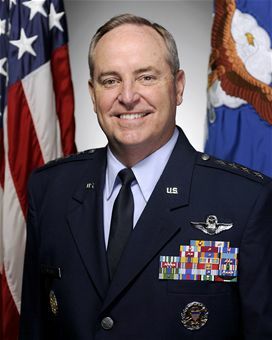 With just three months on the job, you might not know a whole lot about new Chief of Staff of the Air Force Gen. Mark Welsh yet, but what you should know by now is that he has a way with words and that he is a proud airman who believes in the power of, well, air power. We here at Air Force Times are looking forward to collecting notebooks of our favorite catchphrases from the chief and hope you are, too. The big two so far harken to the signature way that Chief Welsh, an F-16 pilot, likes to close out a speech or a letter. But we believe his best work is yet to come. Though that was by far our favorite line from the letter, we’ve pasted the full content below in case you missed the more important things he had to say. If you’ve had the chance to hear the chief speak or will in the future, let us know what your favorite catchphrases are. November is a proud month! Betty and I stood at the Tomb of the Unknown on Veterans Day as President Obama laid a wreath honoring not just our Fallen, but all our nation’s veterans, for everything they (and you) have done to defend American citizens and interests for the past 236 years. During the week before that ceremony, the spirit of the citizen-Airman was on display in grand scale as your Air Force carried hope and comfort to thousands of citizens affected by Hurricane Sandy. C-5s and C-17s carried utility trucks, cherry-pickers, and thousands of blankets from places like California and Arizona to New York and New Jersey. Air Force civil engineers, personnel recovery specialists, medical professionals, firefighters and many others from active duty, the Air National Guard and Air Reserve bases converged on the affected area to rescue more than 250 storm victims. Working beside many other great organizations, the Air Force family answered our nation’s call during a time of need. Seeing President Obama holding a picture of an Air Mobility Command C-5 downloading a utility truck and thanking Defense Secretary Panetta is great stuff! We’re all part of something bigger … I hope you’re as proud of who you are and what you do, as I am of you. It’s been a humbling experience to serve as your chief these first three months. But I’ve been surprised by some of the issues that have required the most attention. First and foremost, dealing with the intolerable number of sexual assaults and unprofessional relationships has been both time-consuming and heart-breaking. The Air Force succeeds because of the professionalism and discipline of our Airmen. Sexual assault undermines that professionalism and discipline, harming not only the individuals involved, but also their unit, their mission and our service. When a fellow Airmen is sexually assaulted, it is devastating. It destroys trust. It demoralizes families. And we’re doing it to ourselves. We MUST do more to protect one another from this crime by reporting unprofessional relationships, strengthening our support of victims, and making a culture of trust and respect a reality for everyone in our Air Force. I need your help … please take care of each other. Betty and I hit the road soon to visit some of the 36,000 Airmen who do the nation’s nuclear deterrent mission each and every day. We can’t wait to meet ’em! F.E. Warren, Malmstrom and Minot are just the beginning — we’ll get to all of you as soon as we can. I just wish we could visit every base every week … although you might think that’s not such a great idea! These first three months have been a whirlwind. Thank you for the overwhelming expressions of support you’ve given to me and Betty. Everywhere we travel, you welcome us as one of your own. This is just an incredible Air Force family! During this month of Thanksgiving, I want to thank you and your family for your service, your sacrifice, and your incredible dedication to the profession of arms. I’m incredibly proud to be an American Airman, not because of the cool toys, but because I have the honor of standing next to you.